Without sparing even one second on my spoiled urge for getting myself comfortable before listening to an album I have never heard before, Nigdeniya is opening the gates completely as soon as I hit the Play button, and is filling the room with sounds that, more than being dark, are alien to me. This is a great experience, and as I am forced into this experiment I get to read about the artists a little. When I read the fascinating book ‘Utopia’ by Thomas More, there was the obvious point when his stories and ideas began to sound wrong and twisted, and his world, his alien world that is no where to be found, is the ground for Nigdeniya’s (Nowhereland) album. This is a mail art project done between Vitaly Maklakov and Michel Madrangeand Dimitry Rodionov. Together they go through realms of dark sounds that collapse like tidal waves on acidic shores of psychedelic hives of sound wiring. While I cannot strictly say that this is a “Dark Ambient” album per se, it certainly brings some freshness to the genre that seems not to move anywhere. 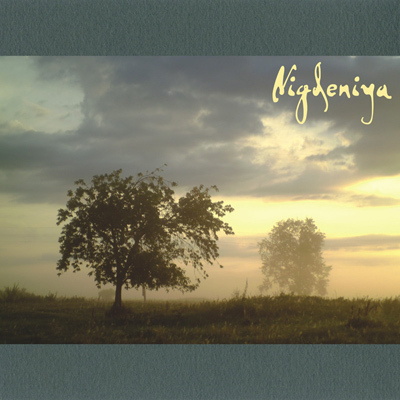 Perhaps the geographical distance between the creators of this music is the responsible element for the powerful dynamics of Nigdeniya’s self titled album. What I love the most about Zhelezobeton’s releases is that I am not quite sure about what to expect before listening to them, and there are always good surprises. Nigdeniya is a great work and one that sparks the interest and curiosity about future plans for the artists behind it. We will see how things go in the future for this nowhereland, for now it looks like a powerful, fascinating and wondrous step to the land of utopia.